When we first published this yummy recipe, foods like sauerkraut were not popular. Today we know fermented foods are SO good for us and we can find things like kombucha, kefir, miso Kimchi and more are easy to find in the grocery store. The sauerkraut is not easily identifiable in the finished soup, it just adds a wonderful tangy flavor. As a fermented veggie, sauerkraut has been made and enjoyed for thousands of years. Fermented foods improve digestion while restoring a healthy balance in your gut. If you have only tried to eat sauerkraut on a hot dog – try this soup! You’ll be pleasantly surprised. Now that we have told you about the goodness of sauerkraut, we have to share the good news about our herb of the week, too. In some cultures, gennel seeds symbolize longevity, courage, and strength. It is the seed of the Fennel plant, and has the fresh, green and licorice-y flavor that the bulb and fronds do. When you are buying fennel seed, make sure to look for green seeds. As the seed ages, it gets brown. Fennel seed packs a powerful nutritional punch, too. They have a plethora of nutrients, essential compounds, anti-oxidants, dietary fiber, minerals, and vitamins. 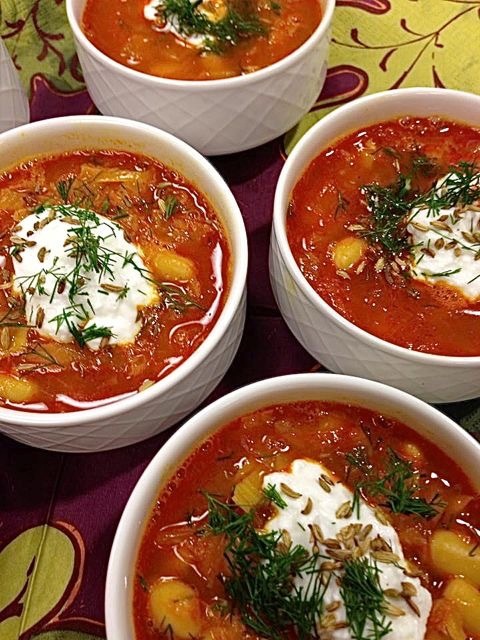 So enjoy this soup with family and friends, we bet it will become a favorite! Step One Heat the olive oil in a stockpot and sauté the onions with the smoked paprika, turmeric and salt and pepper until the onions are very soft. (About 30 minutes over low heat.) Add the garlic cloves in, and cook and stir until fragrant. Step Two Add the veg stock, sauerkraut cannellini beans and artichoke to the pot and cook for an additional 20 minutes or until warm. Remove from the heat and stir in the yogurt. Garnish with dill and the toasted fennel seeds and serve.